Apple Cider Vinegar Diet: Can It Help You Lose Weight? Discover how to lose weight with apple cider vinegar diet. The internet is full of methods that guarantee weight loss but we’re still left to doubt their authenticity since many of them have proven to be ineffective. This has contributed to a lack of trust between the internet and its users. Users should realise that what works for others may not work for them. Each person has a different body type, although our mechanism is the same but the features of our mechanism rather work differently. For example, our metabolism can be slow, fast or normal. Our bodies’ tendencies to absorb fat could be less or more efficient. These factors make key differences to our resulting scenario. What is the best way to determine which weight loss technique is most effectual for us? Any strategy that caters to weight loss through multiple ways, so our bodies can at least find one way that is compatible with the way they function. 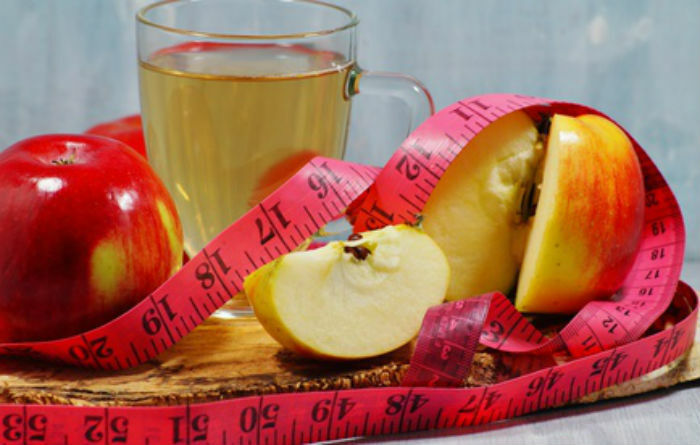 Apple cider vinegar and garcinia cambogia are the top-notches that we’ll be assessing and exploring the weight loss benefits of in this article. Apple cider has been one of history’s essentials. For thousands of years, it has seen incorporation into household cuisines, usually as a tonic consumed separately, or as an added ingredient. The purpose behind this has always been health oriented. A study conducted on mice revealed that the consumption of apple cider vinegar led to an improvement in the way the liver absorbed sugar from the blood, which has potential to result in the regulation of blood glucose level. This ensures the liver is not excessively converting blood sugar into fat. When sugar is readily processed by the liver and converted to glycogen, it allows the body to function normally, unless in the case of excessive sugar intake. For diabetic or pre-diabetic patients, incorporating apple cider to their diet may prevent blood sugar from shooting up. According to studies, apple cider has been found to impact hormonal secretion into the blood(1). By reducing the levels of insulin and stimulating higher ratio of glucagon, increases fat burning and decreases fat storage. This leads to speeding up the metabolism, with the body producing more heat to perform digestive breakdown. More fat is utilized for energy production. Studies performed on rats have reported apple cider’s effect on the increase of the enzyme AMPK. As aforementioned, this has indicated that apple cider has a link to increasing body’s fat burning process. AMPK is the enzyme responsible for the way a body’s mechanism works. An increase leads to the metabolism working faster. This requires more energy usage. Hence, more fat is broken down. Before becoming obese or gaining extra pounds beyond a normal weight range, the body tends to develop a tendency. This tendency then plays into the body becoming habitual of a certain way of performing (read: functioning). The acetic acid(2) present in apple cider has shown to counter this tendency by increasing the expression of genes that target belly fat and liver fat (a.k.a fat burning genes). Studies conducted on rats, where they were put on a high fat diet, had researchers notice a significant increase in the genes responsible for burning fat. This helped them conclude that apple cider vinegar may result in the body being protected from obesity. According to another study, it was found that consuming an element called acetate in the apple cider vinegar may impact the brain to suppress urges to eat leading to an overall reduced food consumption. Considering apple cider vinegar has exhibited positive results, it is at least safe to say the tonic has no side effects when taken in moderation. This isn’t to say its efficiency can’t be challenged. But so far it has demonstrated its functions as promising. Garcinia Cambogia is a tropical fruit native to Indonesia. It goes by several names and has been popularly associated with loss. With the advent of its commercialized preparation, Garcinia Cambogia has been criticized for its hearsay and lack of significant weight reducing ability. The fruit (in its unaltered form), however, is still to be assessed through a more accurate study to determine any contribution to weight reduction. Apple Cider Vinegar with Garcinia Cambogia: Work For Weight Loss? The commercial product Garcinia Cambogia has an ingredient known as hydroxycitric acid which is considered responsible for the boosting of fat-burning and lowering of appetite. Apparently, it does so by blocking the enzyme citrate lyase, which is used for to convert food into fat. It is also said to raise the brain chemical known as serotonin which causes you to be less hungry. However, these weight loss results cannot be considered accurate without clear evidence. So far, the study conducted to report these findings did not take into account other weight loss programs their participants may have been on while they participated in this study. The result can not alone account for the 2 pound weight reduction over a period of 12 weeks. Even so, the amount of weight loss reported isn’t very impressive. When combining this product with apple cider vinegar, expectations rise. Drinking ACV with garcinia cambogia have affected people in curbing their appetite. The combination, apparently, is enriched when both products offer a appetite suppressing feature. The mixture is recommended to be drank 30 minutes before meal intake. The GC pills are only recommended to be taken for a period of 3 to 4 months and not beyond it. Most customers trying this combination have also eliminated a high carb diet and have settled for simpler and natural foods. Doing so, has obscured the formula that may actually be behind any weight loss experienced by them. It is also worthwhile to know that GC pills have been studied and tested for dire side effects as well. It is always a safe bet to know your products in and out before making any serious decision to add them to our diet plans. Author Bio: Andrew Bell, is the co-founder and editor of CaloriesFit.com. With over four years of blogging experience in the niche of health and beauty, he is a true believer of traditional and natural home remedies. apple cider vinegar diet with garcinia cambogiahow long do i have to drink apple cider vinegar to lose weight? How To Get Rid Of Scar Tissue And Stretch Marks?